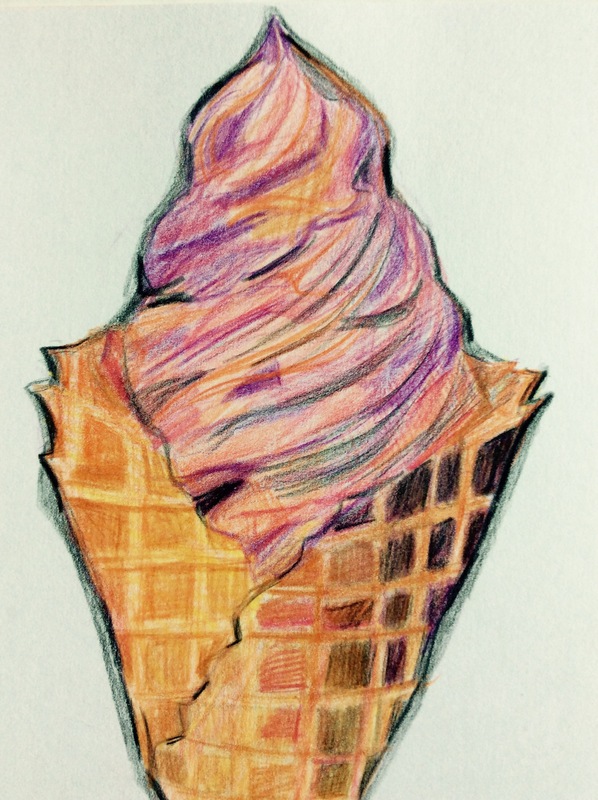 In keeping with my promise, today I’m posting photos of my most recent ice cream-inspired art! The same size and medium (colored pencil), this piece is joining my egg drawing in a new series of food art. What I love about ice cream, aside from the fact that it’s one of my favorite foods, is its iconic imagery. Ice cream, especially in a cone, is as much fun to look upon as it is to eat. It is void of negative connotations. Loving the colors, shapes and textures, I have made a lot of ice-cream inspired art in my days in a variety of mediums, including paint, fiber, pen and colored pencil. Today’s piece features strawberry ice cream, a flavor that I am not one to eat but find to be a lot of fun to draw. I started by sketching an outline in dark purple before filling in the other colors. This is a helpful tip: when sketching the base of a drawing, find a color that will complement and blend with your finished piece. Nine times out of ten, you don’t want to use black. After drawing a general outline, I filled it in with lighter colors and gradually introduced darker colors when adding precision and details. Not sure what food is next, but breakfast and dessert has me feeling compelled to render some sort of entree! So often when life gets busy the first thing that gets cut from the schedule is fun. When there is a lot to be done I know I sometimes feel guilty “wasting time” or “goofing off”. But having busy lives does not mean you should stop having fun. It simply means you make room for it in your schedule. Andy and I both lead extremely busy lives. This year especially, as I am balancing a part-time job and commuting an hour to grad school and he is balancing his career and major home renovations. Therefore, this past weekend we decided to create our own fun holiday experience by having our own personal Oktoberfest, inspired by the incredible parties that go on every October in Munich. So what does this mean exactly? 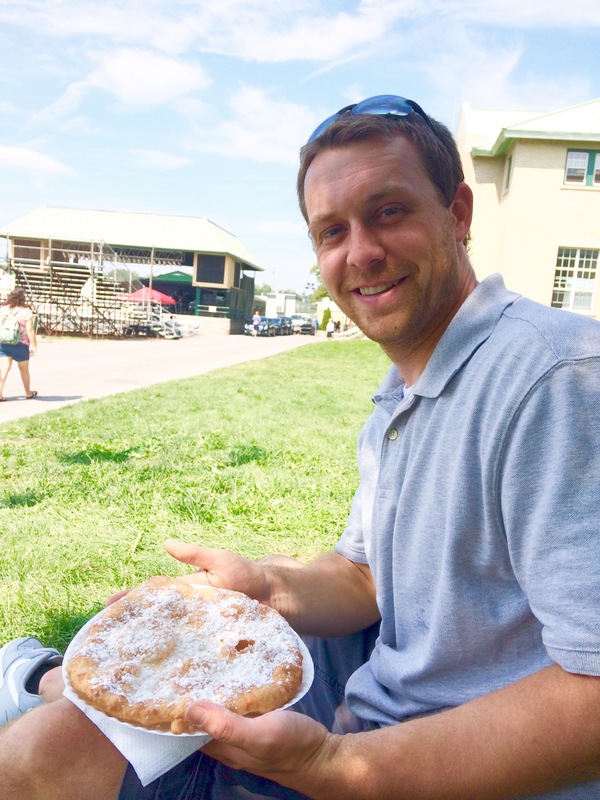 Well, keeping up with Oktoberfest tradition, it meant lots of food and lots of beer! Here’s a recap. For our food we decided to prepare traditional German dishes (obviously) and landed on a pretty diverse and delicious menu. For snacking and appetizer purposes we purchased some horseradish cheese dip and pretzels. 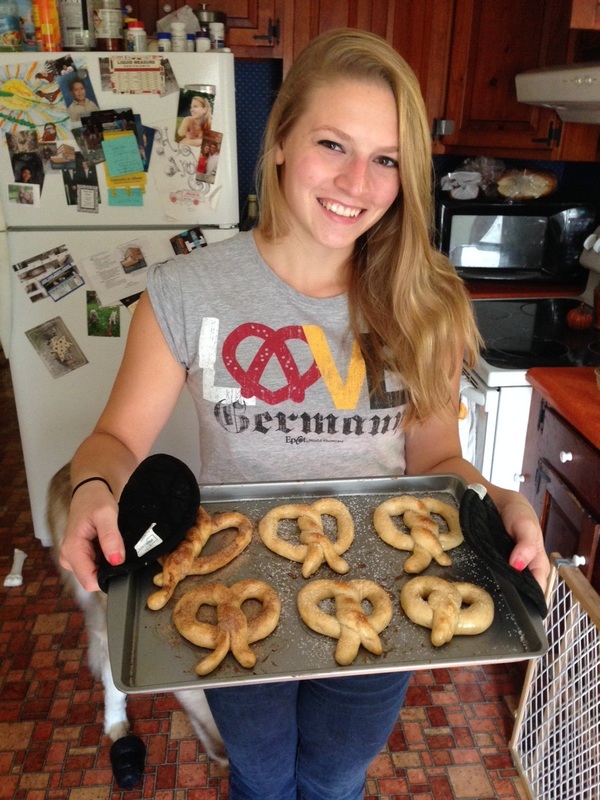 However, we then got much more creative by actually making our own pretzels. I would recommend homemade pretzels to anyone as they are easy and fun to make as well as delicious.I also prepared homemade applesauce from the apples we had picked fresh. 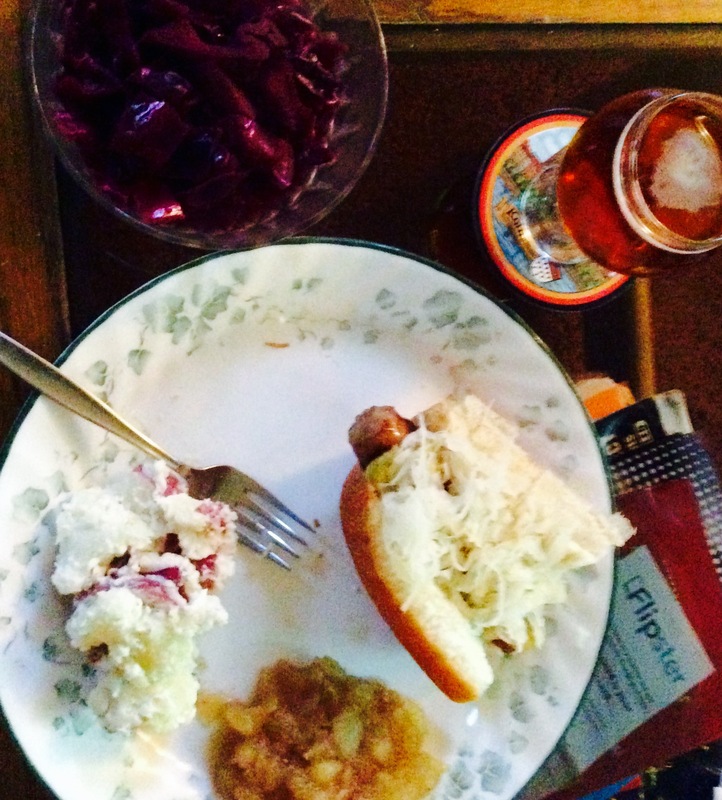 For dinner we prepared beer brats with sauerkraut and spicy brown mustard, sweet and sour cabbage and homemade potato salad. Although the brats were just the typical packaged variety we improved the flavor by sauteing them in beer and crisping them on the grill. 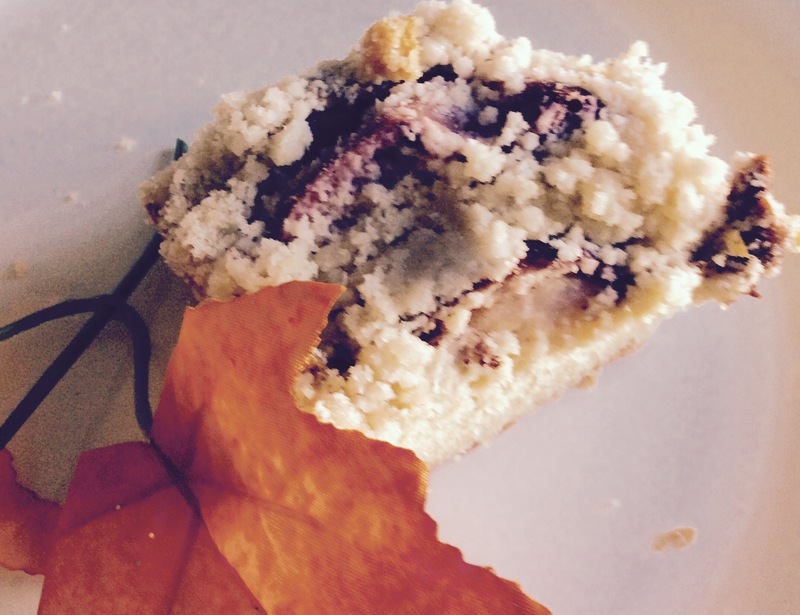 And if that wasn’t enough we also made an apple streusel cake for dessert! 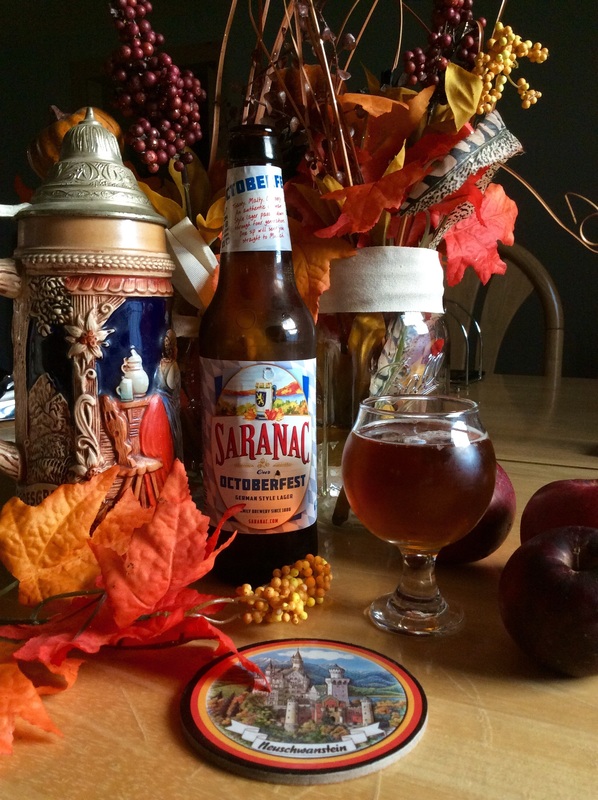 Beer is an essential element of Oktoberfest, so therefore it was only right that we treated ourselves to several different variations of this brew. 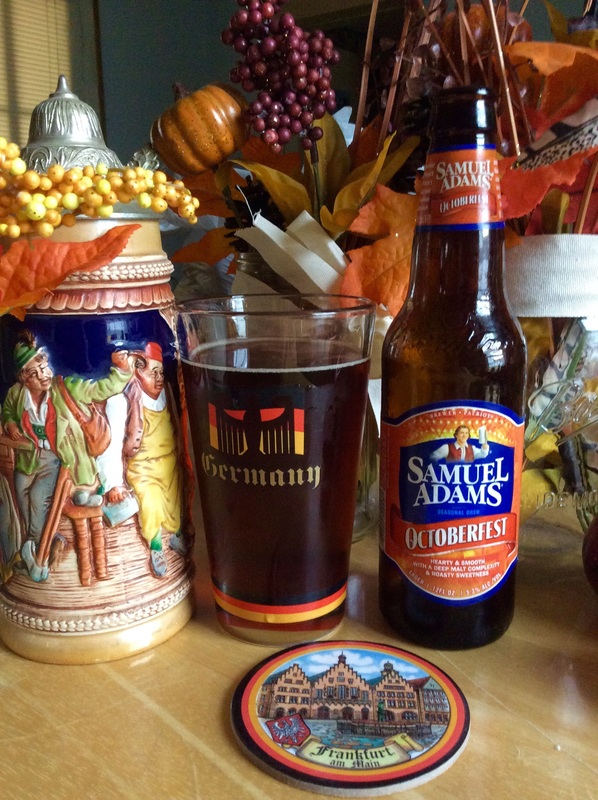 One of our favorites and a must have is Sam Adam’s take on the beverage. 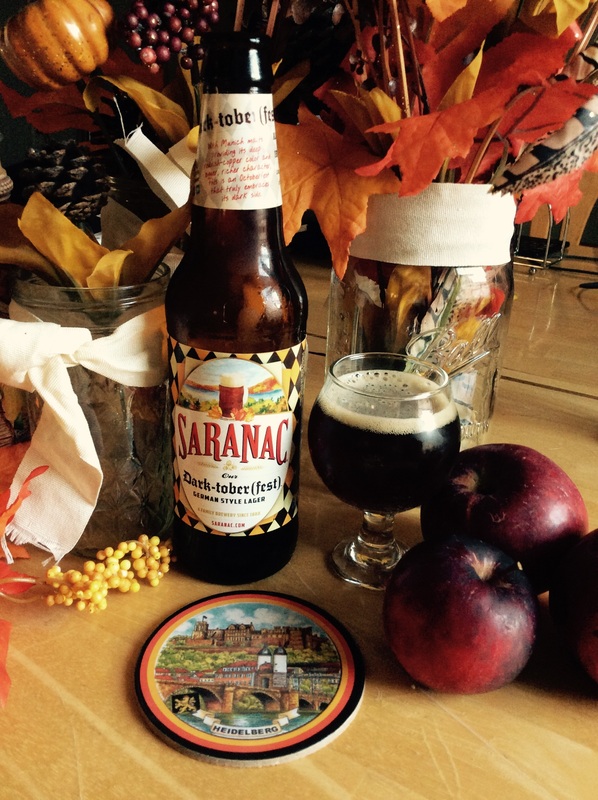 as well as their creative “Darktoberfest.” The Darktoberfest obviously possesses a darker flavor and is extremely satisfying when paired with some of these hearty dishes. 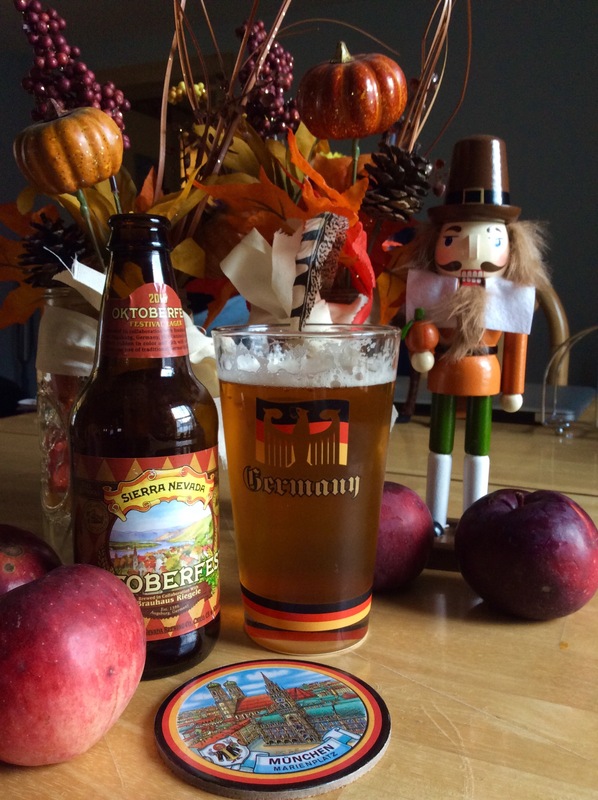 And finally, after doing some research we discovered that Sierra Nevada actually partners with a brewery in Germany to create their Oktoberfest beer. We then deemed this beverage essential and I’m especially glad we did! (This beverage may now be one of my favorites). So as the old expression goes, work hard play hard. When life gets tough make time for yourself and come up with new ways to celebrate. Fun doesn’t always have to be large groups of people and extravagant parties. Sometimes fun is as simple and spending the day cooking with the person (and dogs) you care about most.